Notable ‘Dual SIM always on’ feature has the ability to receive calls from either number simultaneously by automatically forwarding calls from SIM 2 to the SIM 1 when when the user is talking on SIM 1. Comes with a 3.5-inch HVGA LCD touchscreen with 320x480pixel resolution display powred by 823MHz processor with 512MB RAM and 3GB storage (upto 32GB with microSD card slot). It runs on Android 2.3 Gingerbread with Samsung’s TouchWiz user interface. Connectivity side it has WiFi b/g/n,900/2100 HSDPA, Bluetooth 3.0 and a microUSB port. It sports 5MP rear camera and measures 112.74 x 61.5 x 11.5 mm weighing 122gms and is housed with a standard 1300mAh battery delivering 390 minutes of 3G talktime or 410 hours of 3G standby. No news about pric but the Galaxy Ace Duos will launch first in Russia this June but it will later roll out to the rest of Europe, CIS, Latin America, Southeast and Southwest Asia, Middle East, Africa, and China. 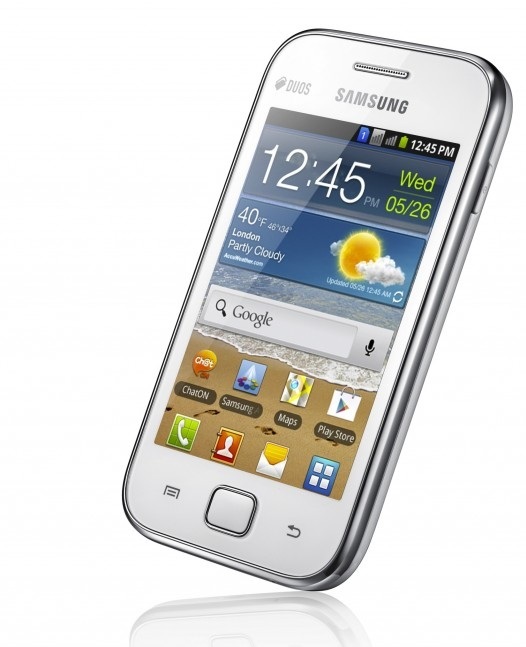 Tags:Galaxy Ace Duos,Samsung Galaxy Ace Duos, Samsung Galaxy Ace Duos features, Samsung Galaxy Ace Duos specs, Samsung Galaxy Ace Duos details, Samsung Galaxy Ace Duos availability, Samsung Galaxy Ace Duos price, Samsung Galaxy Ace Duos images.